Chinese have mixed feelings about the possibility of a Hillary Clinton presidency. Hillary Clinton’s widely anticipated announcement of her second presidential run on Sunday came also as no surprise to a vigilant China, which has long been on the lookout for America’s next commander-in-chief. Offering a cool reaction to Clinton’s announcement, Chinese Foreign Ministry Spokesman Hong Lei said Monday in Beijing that the 2016 presidential elections are an internal affair, implying that China has no stake or particular interest in it. Instead, he went on to emphasize that maintaining a healthy relationship suits the fundamental interests of both the American and Chinese people and helps protect peace and stability in the Asia-Pacific and the world. But behind the official indifference suggested by this canned response are serious doubts shared by the Chinese government and some Chinese scholars about America’s former top diplomat, whose stance they say has been too antagonistic to China. There are two different Hillary Clintons known in China. As first lady in the 1990s, China was as wowed by what they saw as Clinton’s charisma, wisdom and grace on the world stage as they were by the eloquence of her husband, then President Bill Clinton. Hillary – as she is routinely referred to in China – proved so popular that her 2003 book Living History about her early years became a bestseller inside China. 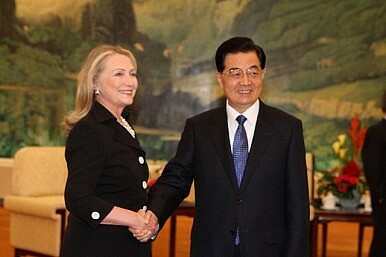 In contrast, as President Barack Obama’s secretary of State from 2009 to 2013, Chinese began to see Clinton as a garrulous, brash, and often grumpy foreign policy hawk, appearing to deliberately single out China on issues such as trade, human rights, territorial disputes, and Beijing’s positions at the United Nations Security Council. A highlight of her tenure, the signature “Asia rebalance” strategy aiming to slowly deploy Washington’s best diplomatic, economic, and military resources to the Asia-Pacific, is interpreted by Beijing as a back-handed move to counter and isolate China in the region. The relationship became so fraught that Clinton’s latest book Hard Choices – featuring sizable chapters discussing her diplomatic experiences with Beijing under former President Hu Jintao – was blocked in China. Li Haidong, a professor of international studies at China Foreign Affairs University, told state-run Global Times that if elected president in 2016, Clinton would very likely carry on her “heavy-handed, unbending” diplomatic style. Li, however, was also optimistic. After all, being a president is different from being a secretary of State. As some pointed out, despite Clinton’s often-contentious stance against Beijing while at the State Department, as president, she would have to avoid direct confrontations with China and maintain a strategy that honors both cooperation and competition. Clinton’s presidential run will be watched closely by Chinese President Xi Jinping, a confident and forceful leader who as vice president in 2012 notoriously cancelled a planned meeting with Clinton. Since ascending to power in early 2013, Xi’s rapid consolidation of military and civilian power as well as his unbending position on territorial disputes has won him nationalistic cheers. Clearly, whoever becomes the next U.S. president will face some tough challenges in the Asia-Pacific. Clinton, who undisputedly has the most name recognition in China among the 2016 presidential candidates, may have already started tailoring her China-related campaign messages to American voters. In the meantime, many in China will be waiting to see which face a President Hillary Clinton would present to the world’s most populous country. Kevin Wang is a researcher for CNN’s editorial oversight team in Atlanta. The views here are his own. What China Is Missing as It Watches the US Presidential CampaignThe Presidential Politics of US China PolicyChina’s Role in the US Presidential CampaignCould a Donald Trump Presidency Improve US-China Ties? Chinese Netizens Say YesIf Chinese Could Vote in US Presidential Primaries, Who Would They Choose?